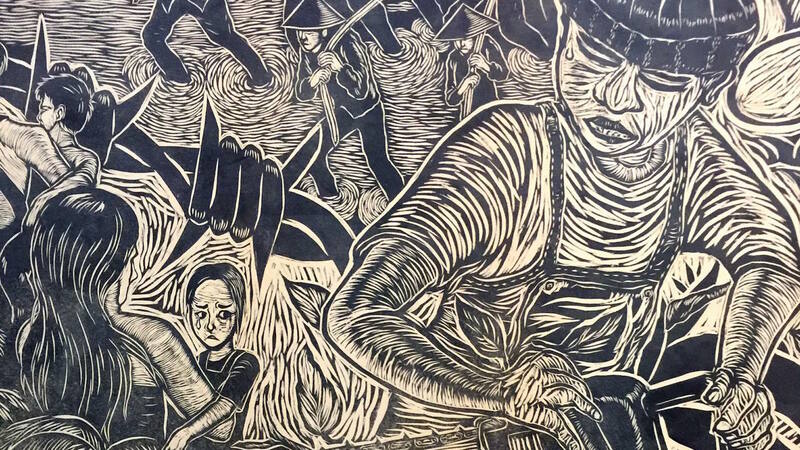 The dust appears to have settled on the recent controversy surrounding the removal of Malaysian art collective Pangrok Sulap’s artwork Sabah Tanah Air-Ku from the art exhibition, “Escape from the SEA”. Organized by the Japan Foundation Kuala Lumpur (JFKL), “Escape from the SEA” was a group exhibition featuring works by Southeast Asian artists of varying backgrounds, and located in two different venues in Kuala Lumpur: the National Visual Arts Gallery and APW Bangsar. 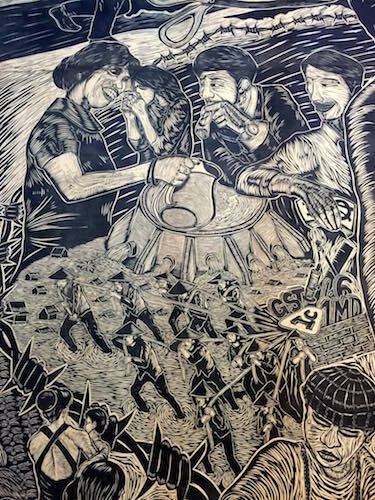 A few days after the opening, a large woodcut print by Sabahan artists Pangrok Sulap was taken down from the APW venue but no with no reasons given. The local arts community tried to investigate on their own as no explanation was forthcoming even after a week. 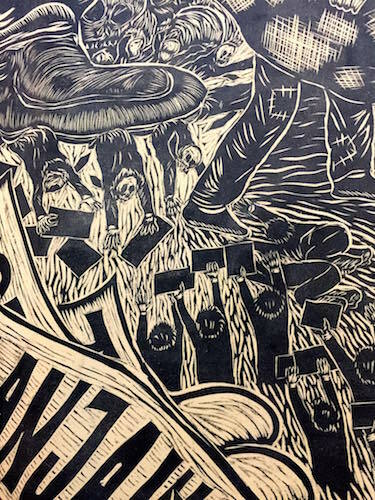 A few artists who were part of the exhibition issued a statement condemning the removal, and disgruntled artists and academics took to social media to vent and criticize the person who was rumoured to have complained to the authorities. A few weeks later, Pangrok Sulap, who had a second work on display at the National Visual Arts Gallery venue, withdrew completely from the exhibition in protest. 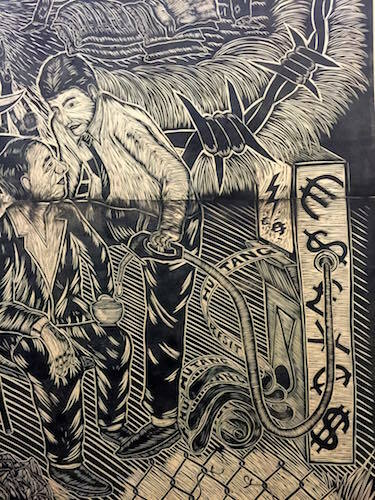 The exhibition ended its two-month run in late April 2017 with no further brouhaha but Pangrok Sulap has achieved unexpected fame due to what transpired. The art collective recently crowd-funded enough money to travel to Spain to represent North Borneo (incidentally, not Malaysia) at the 3rd Traditional Tattoo and World Culture Festival in May this year. JFKL, after receiving negative press as a result of its decision to remove the work, has since gained unexpected notoriety in art circles – not quite the kind of publicity the JFKL had hoped to garner to celebrate the 60th anniversary of Malaysia-Japan diplomatic relations, also this year. During the height of the controversy, around the time the issue exploded on social media, a few artists from Five Arts Centre who were part of the exhibition, helped to organize a closed-door roundtable discussion titled, “No ESCAPE from the C?” – the “C” being a snarky reference to censorship. The discussion ostensibly aimed to use the Pangrok Sulap case as a starting point for a larger, more extensive examination of censorship of the arts in Malaysia and the various stakeholders involved in the valuing of culture. I was invited to be an observer during the proceedings and to write about what was discussed among those directly affected by the case at hand but also by those who had participated online in robust (and contentious) debates about censorship of the arts in Malaysia as a whole: theatre practitioners, curators, academics, and visual and performance artists. This article is not, strictly speaking, a detailed report of the closed-door meeting but rather, a summary of some of the ideas that the meeting threw up. From the get-go, the JFKL, being the key player in a morass of obfuscation, was taken to task for not being open about how the decision to remove the artwork came to pass. The Malaysian arts community have become used to a lack of transparency from its own governmental bodies but it clearly expected more from a reputable international non-governmental body like the JFKL, which has a long history in Malaysia. But perhaps we expected too much. There was a lot at stake during the opening of the “Escape from the SEA” and much of it had nothing to do with art but more to do with politics, trade and bilateral agreements between two nations. On the opening night of the exhibition, when it was pointed out to the director of JFKL that the artwork Sabah Tanah Air-Ku was actually a depiction of the Sabah Chief Minister in a negative light, alarms bells naturally went off. Being a semi-governmental organization with direct ties to Japan, JFKL evidently did not want to jeopardize its diplomatic relations with Malaysia. 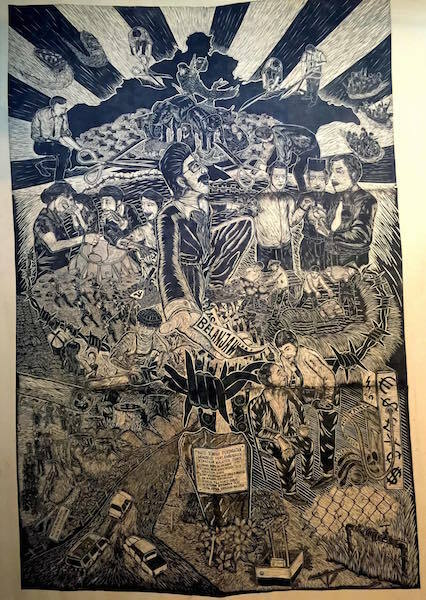 At the end of the day, art had to take a backseat to realpolitik; this was the context against which Pangrok Sulap’s work was interpreted and the decision to censor was swift and decisive. To expect JFKL to act differently is naive. Even though the actions of the JFKL provoked the ire of many, what seemed to be more troubling to the participants at the roundtable was also the lack of a cogent and similarly swift explanation from the two lead curators, one of whom was a Malaysian and himself a member of the local arts community. The latter’s reticence to be held accountable was unseemly and the excuses he proffered, such as not being sure of the ambit of his role as curator, was rather puzzling. Questions about curatorial ethics were not directly broached. However, one of the co-curators of the exhibition expressed great disappointment with the asymmetrical flow of information within the curatorial team and was angered by how some of them appeared to be left out of the initial discussions about the artwork’s removal. A timeline of what happened was published online to illustrate the uneven transmission of information. The uneven hierarchies of power between curators and the rest of the JFKL, as well as those among the curators themselves were obvious, but any discussion of strategies to dismantle or circumvent them proved elusive. Throughout the meeting, I detected a palpable tension between the need to have someone to blame and the realization that some of the blame had to be directed internally and primarily to the curators. But is it wise to apportion blame to those who do not even have the power to make or unmake decisions? The closed-door roundtable meeting lasted more than three hours but despite the length of the discussions, a slew of questions continue to remain unasked. Who is the custodian of the artworks in any art exhibition? What is the role and responsibility of a curator and/or co-curators in relation to the exhibition, the organizers, the artists, the artworks and the public? If there is a complaint about an artwork or artist, what is the standard operating procedure (SOP) to deal with such a complaint? Who devised the SOP and in whose interest? If there is no SOP then why is there none? Who benefits from and who is disadvantaged by the presence or absence of a SOP? Who has the authority to remove a work and under what circumstances would this authority be exercised? Are there checks and balances to ensure there are limits to this authority? Who would serve as a credible check and balance and to what end? In my view, until some of these questions are addressed in an open, honest, consultative and deliberative manner, we will never escape the C and perhaps, we never should. Guest Contributor Carmen Nge is currently Assistant Professor at the Faculty of Creative Industries, Universiti Tunku Abdul Rahman, Malaysia. She has been writing about Malaysian culture, specifically the visual arts, for more than ten years. She recently co-edited a book, Ismail Hashim: Essays, Interviews and Archives, with Malaysian artist Wong Hoy Cheong in 2015. She teaches broadly in the subject fields of Malaysian media and culture, critical thinking, science fiction, and games design.